Even the threat of storms didn't keep pilots and owners away as more than 125 people attended this fall AOPA Air Safety Institute Safety Seminar, hosted by Lakeshore Aviation. It was, indeed, a huge success! Following a delicious chicken soup and award-winning "Nesco 3-Amigos Chili" dinner, we settled down to an awards presentation and an excellent program titled "Weather Challenge", aimed at bolstering real-world weather wisdom. AOPA's Pat Brown presented the seminar in typical humorous and fast-paced fashion. 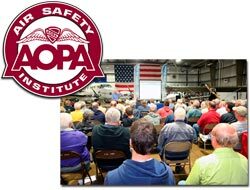 More than 120 people attended this spring AOPA Air Safety Institute Safety Seminar, hosted by Lakeshore Aviation — a huge success! Following a delicious brat & burger cookout we settled down to a refresher course on reading navigational maps. Of course we also got some horror stories about pilots who failed to note important information on their maps at certain airports and got themselves into serious trouble. Despite the lack of military aircraft (due to the federal government's sequester) and the threat of rain, this year's airshow was as exciting as ever. The aerial stunts and demonstrations, along with exciting ground, jet-powered performances and static displays provided a lot of fun and amazement for every age. This annual event is one of the most recognized regional airshows in the country, hosting some of the world’s top airshow performers. Complete details of the show can be viewed at www.ThunderOnTheLakeshore.com.